The problem was that starting with Adobe Reader 10, the Protected Mode is enabled by default, to prohibit users from opening unauthorized PDF files, thus protecting a user computer from potentially malicious PDF documents. If you trust the sources of files, install security updates in time and keep your antivirus databases up-to-date, the Protected Mode can be disabled. 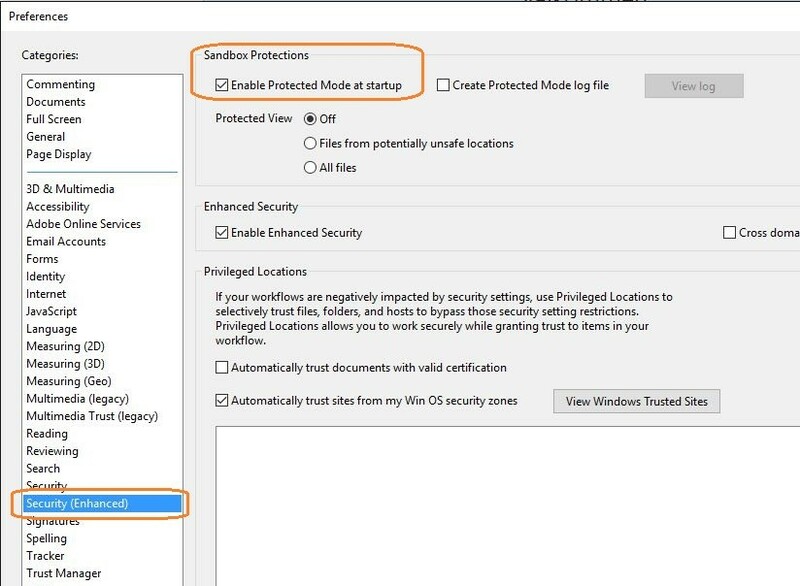 It can be disabled individually for the specific user by unchecking Enable Protected Mode at startup option in Adobe Reader interface Edit → Preferences → Security (Enhanced). Tip. If third-party PDF files are likely to get to a user computer, you’d better not to disable the Protected Mode. Instead, you can configure selective trust to the specific paths or files in the section Privileged Locations of the same menu. You can disable the Protected Mode in the registry as well. For the specific user: create a new parameter with the name bProtectedMode and value 0 in the following registry branch: HKEY_CURRENT_USER\Software\Adobe\Acrobat Reader\11.0\Privileged. New-ItemProperty -Path "HKCU:\SOFTWARE\Adobe\Acrobat Reader\11.0\Privileged" –Name "bProtectedMode" -Value 0 -PropertyType "DWord"
For all users of a computer: create a DWORD parameter with the name bProtectedMode and the value 0 in the branch: HKEY_LOCAL_MACHINE\SOFTWARE\Policies\Adobe\Acrobat Reader\11.0\FeatureLockDown. 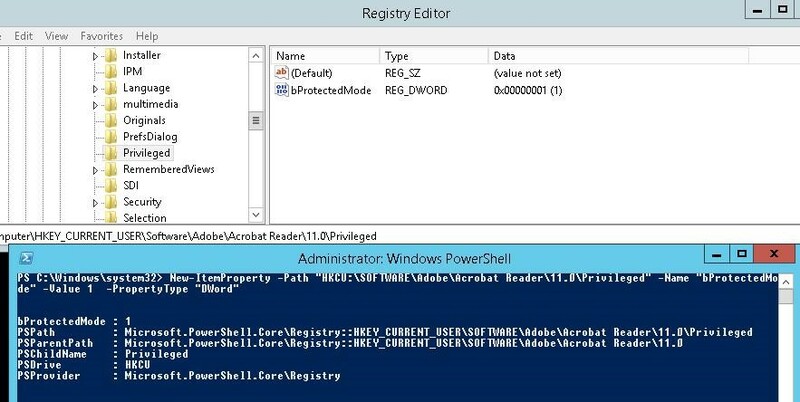 New-ItemProperty -Path "HKLM:\SOFTWARE\Policies\Adobe\Acrobat Reader\11.0\FeatureLockDown" –Name "bProtectedMode" -Value 0 -PropertyType "DWord"
After you have made the changes to the registry, restart Adobe Reader.